Ole Gunnar Solskjaer responds to message from fans fearful Paul Pogba will leave Man Utd? Ole Gunnar Solskjaer and his players arrived in Barcelona this evening and the manager attended his press conference shortly after. The press began aiming questions at Solskjaer at around 16.20pm and he was asked about Paul Pogba’s future, amid talk the Frenchman could leave Manchester for Spain. As well as covering the game tomorrow night, Spanish press would have attended the press conference for other reasons too, keeping their finger on the pulse ahead of the transfer window. Pogba has openly admitted that it would be a ‘dream’ to play for Real Madrid, and Los Blancos manager Zinedine Zidane publicly stated he’d like to work with the midfielder. 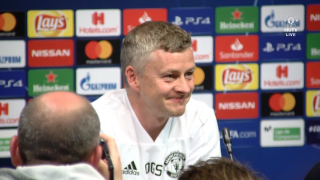 That adds fuel to transfer speculation, so Solskjaer was bound to be asked about Pogba and Madrid at today’s press conference. The reporter claims to have spoken to United fans who are fearful that Pogba might leave the club. However, Ole issued a message to those fans saying they shouldn’t worry too much about it. The manager is always going to say the player’s focus is on United and the next game, unless he’s causing complete chaos which isn’t the case, and Pogba just scored a crucial brace in the last game. This should be the stage for Pogba to shine. A performance for us to remember as United knock Barca out of the Champions League. For now, we can only dream but his future remains unsolved. It is also worth pointing out that he says they shouldn’t worry to much.